James Grant; he’s an enigmatic artist. You never know what’s coming next, but you know it won’t be dull. I’ll save the history lesson for another day, but let’s just say he’s been around for a while. 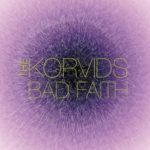 His latest venture is a collaboration with producer Gordy Goudie under the name of The Korvids and “Bad Faith” is the third single taken from the upcoming album “The Korvids”. “Bad Faith” isn’t just influenced by late seventies disco, it is late seventies disco, from the melodic bassline and clipped, toppy rhythm guitar parts to the congas and falsetto vocals. It’s a joyous romp through everything that was great about the heyday of disco; it’s played with style and panache, but it’s also great fun. What more could you ask for? The publicity for the single focusses on the musical style as a departure from James Grant’s previous work but there are elements of the single that have echoes of his past work; the album “Strange Kind of Love” had a funky feel and was also produced by Gary Katz, who was brought in to remix this single. This James Grant and his past incarnations have more in common than you might think. James Grant, it’s good to hear from you again. Out now on Nang Records.